Racetrack memory is a potential next-generation solution for our digital storage devices. However, current experiments using single-layer ferromagnetic nanowires are less efficient than expected. New research published in Scientific Reports shows that replacing them with a double-layered synthetic ferrimagnet nanowire reduces electric current requirements by a factor of ten, and power requirements by a factor of one hundred. When shopping for a new computer, we have to make a choice between a cheap conventional hard drive, and a solid state storage device. 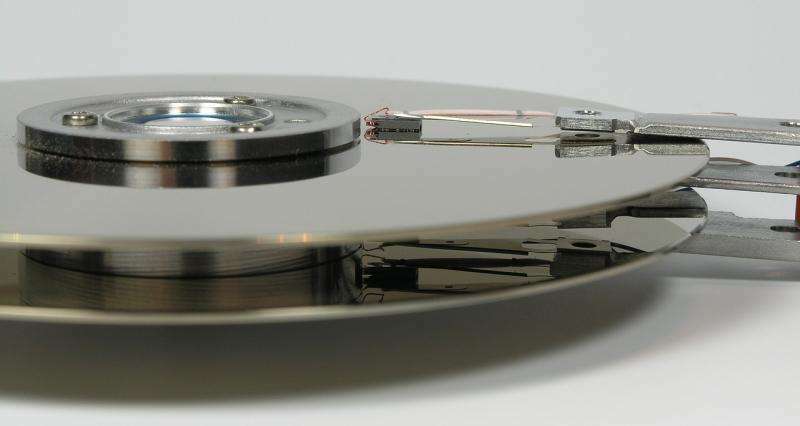 Conventional hard disks have moving parts, which can fail, and it takes a lot of power to keep the disks spinning. Solid state devices are faster, and less prone to failure, but they are considerably more expensive. Research recently published in Scientific Reports brings us closer to a third option - a new style of device that has the potential to be 100 times cheaper than current technologies. Racetrack memory is an experimental form of storage that stores data as a series of magnetic domains in a nanowire, using electrical currents to 'push' the domains past a read/write element. Racetrack memory would have a higher storage density than comparable solid state devices combined with more rapid read/write performance and lower energy consumption. In experimental devices using a single ferromagnetic nanowire, performance has been affected by imperfections in the wire, which make it harder to move the magnetic domains, and requires higher electric currents. Christopher Marrows, Professor of Condensed Matter Physics at the University of Leeds, led an international collaboration of researchers investigating the hypothesis that performance could be improved by using a two-layered nanowire, with opposing magnetic domains in each layer to form a synthetic ferrimagnet. This approach would simplify the domain wall structures. As they needed to determine what was happening in both wire layers, the researchers used a combination of imaging approaches. Transmission Electron Microscopy (TEM), carried out at the University of Glasgow, showed what was occurring in the combined layers. On Diamond's Nanoscience beamline (I06), the researchers used XMCD-PEEM (X-ray Magnetic Circular Dichroism, X-ray Photoelectron Emission Microscopy), a technique which is very surface sensitive and thus sees into the top layer of the nanowire. By combining the two sets of results, the events occurring in both layers can be known. The results showed that the synthetic ferrimagnet does indeed allow domain walls to move at a lower current, by a factor of 10. This corresponds to a 100-fold reduction in the amount of power required. Theoretical modelling (carried out at the RIKEN Center for Emergent Matter Science) explains the effect, showing that the simpler domain walls are not the only factor; the way the layers interact also makes it easier to move the data. For the full potential of racetrack memory to be realised, it needs to move beyond 2-D (a flat wire on a flat surface), to 3-D memory towers, at which point the full storage density/cost reduction benefits will come into play. In order for it to become a possibility another breakthrough is necessary. In the meantime, Prof Marrows has turned his attention to skyrmions, which he describes as domain walls wrapped into circular objects. "If you think of domain walls as beads moving on an abacus," he says, "then skyrmions are particles on a surface - they can move in 2-D. They could also be used to build the racetrack memory our future devices will rely on." "What's particularly exciting about this field of research," Prof Marrows continues, "is that we're studying esoteric quantum physics concepts that are surprisingly close to having real world applications."